Even for microbes, strength lies in numbers. In nature, most bacteria don’t live as free-floating cells. Instead, they are organized into complex communities, known as biofilms1. 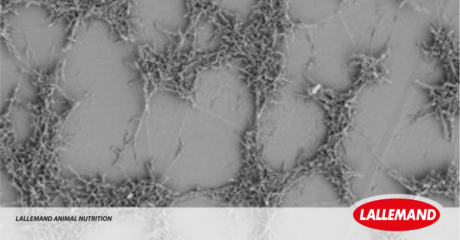 A biofilm is defined as a community of microorganisms fixed to a surface. They secrete a protective extracellular matrix, which can represent 85% of the biofilm biomass. Properties of bacteria in a biofilm are very different from those of the same bacteria in their free-floating, or planktonic, form. Biofilms can represent very complex ecosystems developing cell-to-cell communication systems (quorum sensing). Biofilms are of increased concern in medicine. Bacteria in a biofilm are 10–1,000 times more resistant to antibiotics than their planktonic counterparts, and 60-80 % of microbial infections are caused by bacteria in biofilm. Some examples of positive or negative biofilms include: the dental plaque, the gut microbiota, biofouling of ship hulls, inside drinking water pipelines, oil forages and more. In animal nutrition, the pipelines and tank of a pig liquid feed machine and any farm building surface also host biofilms that can be a potential threat for animal health if not controlled. 1Watnick P, Kolter R. Biofilm, City of Microbes. Journal of Bacteriology. 2000;182(10):2675- 2679.